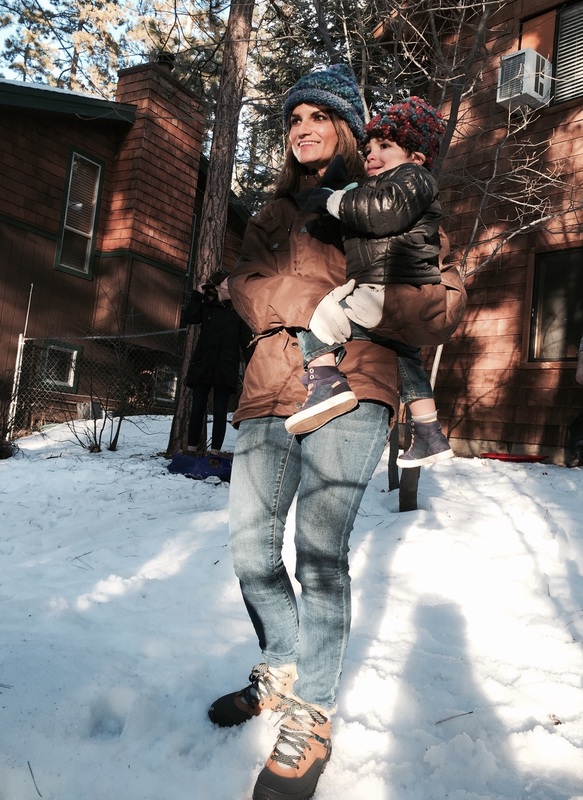 despite their expressions to the contrary, we cheeks had a blaaaast in idyllwild over mlk weekend. our friends were smart enough to book a place months ago and asked if we wanted to go. i immediately text back heck yes, please! we ended up sharing a modest-sized cabin in the woods with two other families: six adults and 5 kids. that may sound like the worst thing ever but it kind of made things easier. we also drank a lot of beer and spent one awesome night in the jacuzzi after the kids went to bed. TAKE ME BACK! now brace yourselves for a lot of pictures of snow and wood. i loved our cabin. it was just big enough for us not to be completely on top of one another and cozy enough to make it intimate. and the smell. it smelled like cabin. they also provided a pack 'n' play and a ton of toys. but the best part, other than the hot tub, was the front yard. it was big and went down a slight hill, making it perfect for sledding! good grief guys it was the best. we went out for dinner every night. and for the most part the boys were great. but there were a few moments when i was like really? where is your mother? OH YEAH. when will this phase end? we ventured away from the cabin to do more sledding and found this area just on the side of the road. that's what everyone does really. a few of the slopes were too fast to sled down and people recommended just sliding down on our tooshies. aside from having wet cheeks the rest of the afternoon it was pretty great. we could have spent the whole day there but knox was kind of over it. poor little guy had a hard time walking on the icy snow. cabin fever did start to settle in on day two and the littles were fighting naps so we took a walk into the village square. my only complaint is that the sidewalk situation could use some work, especially if you are rolling with a stroller like we were. but otherwise it is a picturesque mountain town, with just enough modern welcomed by the timeless kitsch and nostalgia. mom + pop met current cool perfectly. it won me over. but seriously, more sidewalks. and we're out! until next time idyllwild! now one more stop before home... to be continued...!